Why did you start CrowdClock? I was in my parents home sitting around the dinner table as we usually do on the weekends, and my dad expressed to me a pain point he was experiencing as a physician in his practice. The pain was that there was no efficient way for his patients to book times with him. Calls would get lost in voice mail, hang-ups, after-hour calls and similar situations. So he and I began to formulate a solution. The first idea was an app specific to his practice, and if successful we could license the app to other clinics. Then we began to see that scheduling is a problem across every industry imaginable. That’s how CrowdClock was born. 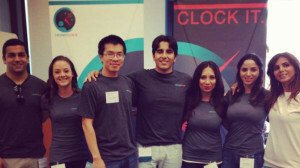 How does Crowd Clock relieve the pain of making appointments? CrowdClock is not simply an appointment-setting solution. I say this because the typical solution might show you an available time. The user then books it. We believe that is outdated. It completely ignores everything else about the user. What else do they have going on? Where are their other appointments? Is there an available time for them? At CrowdClock we take all of those factors into consideration and then present to you the best viable time that fits into your life. Yashar Ahmadpour with the CrowdClock team. Your app is available in the Apple App Store store. How has the response been so far? We did a quiet release of CrowdClock in the Apple App Store. Android is coming later. The expectation with the release was to be able to understand the different sorts of appointments users would make, and with whom they would make them: business or friend, group or individual. It has also served as a great case study to understand in a known environment — San Diego — what we were missing. What did we need to build, or subtract based on user behavior? Seeing the results over the last few months has enabled us to develop a more mature, more useful product. We now have an app that will enable users to schedule appointments with any friend or business, even if they are not signed up for CrowdClock yet. We expect to roll that out to the public later in the year as we are still testing it with a select group. What’s next on your product road map? We’re in stealth mode on the next product. What I can tell you is that we are building something entirely new. And we can’t wait until we can reveal it! This is your third startup. What advice do you have for new entrepreneurs? Is it three already? My advice to anyone setting out on this perilous, crazy, maniacal, impossible dream of starting something of your own is to recognize that your life will not be easy. It will be extremely tough. There will be times you won’t know where the next rent is going to come from. Or the next tank of gas. Or the next meal. And that is on top of what your friends, family, and peers might think of you. And if you let them get under your skin, you will lose and give up. If you cannot cope with the immense stress, you will have to give up. To paraphrase Randy Pausch of MIT, the walls were not built to keep you out. They were built to see who believed so much in their vision, in the possibility of success, that they inevitably found a way over the wall. If you are not defeated by everything life throws at you, then you are ready to join this club of misfits. My last advice is that you build a strong team around you. Find people smarter than you, and advisers who can guide you. Above all, love what it is you are doing every single second. The moment that excitement fades, you need to get out or take a break to reflect on whether or not you should do this.